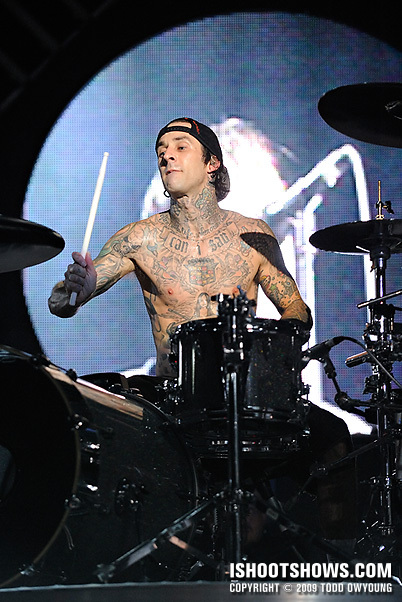 Under bright, high-contrast spotlights, Travis Barker, Mark Hoppus, and Tom DeLonge came together as Blink-182 to tear it up on their 2009 reunion tour. This was the standard: first three, no flash. 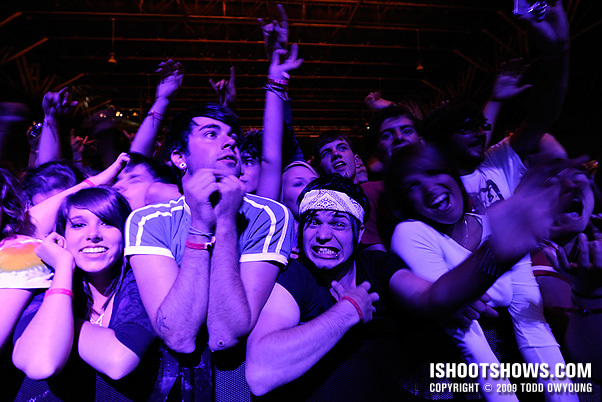 It was no surprise, being a high-energy pop punk show, that the shooting time flew by. 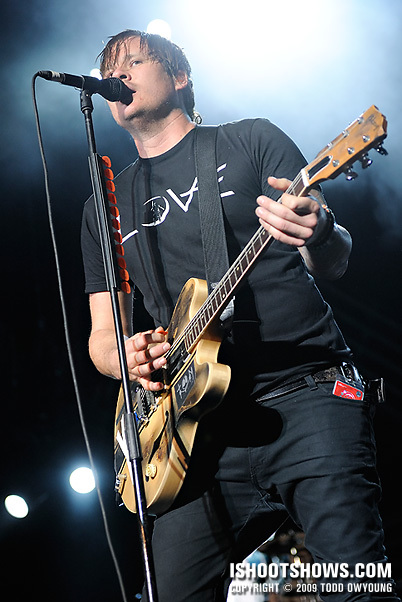 The setup for this show was pretty stock except that there were three or four road cases butted up to the stage that were used by Tom DeLonge and Mark Hoppus throughout the set. All the members used in-ear monitors, so there were no wedges to shoot around. 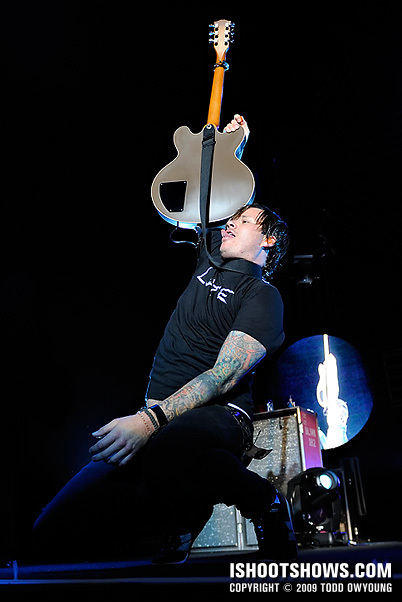 The most active member on stage was easily Tom DeLonge, who took ample opportunity to ham it up for the camera and play out at the front of the stage during the first three songs. 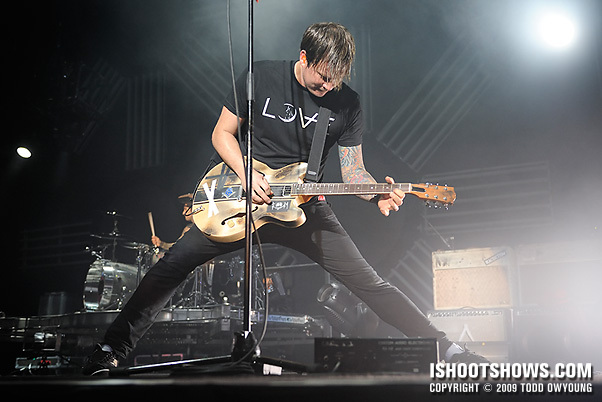 DeLonge never missed an opportunity to rock his hyper-extended power stance – the only snag was that he often did so behind his mic stand, so shadows and angles are a consideration for those instances. 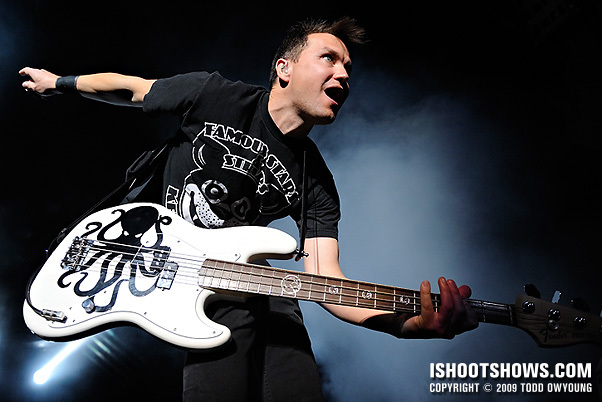 Mark Hoppus also played to the camera during the first song, coming out several times and thrusting his bass out with a huge grin on his face. 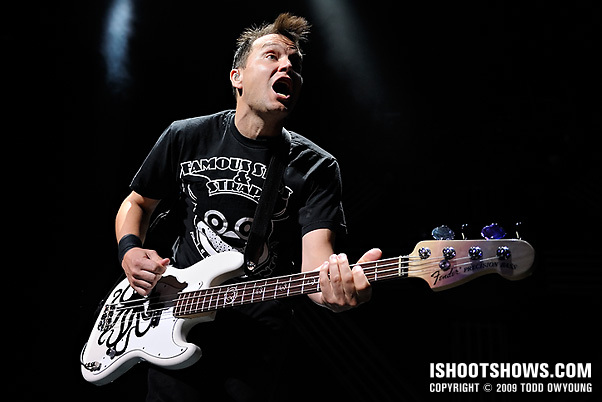 After shooting this concert, I'd say that the big thing to photograph is the instances when Hoppus or DeLonge come out from behind their mics and rock out. This is especially true during the first song when the band is greeting/working the crowd, so keep your eyes peeled and bring your track shoes! 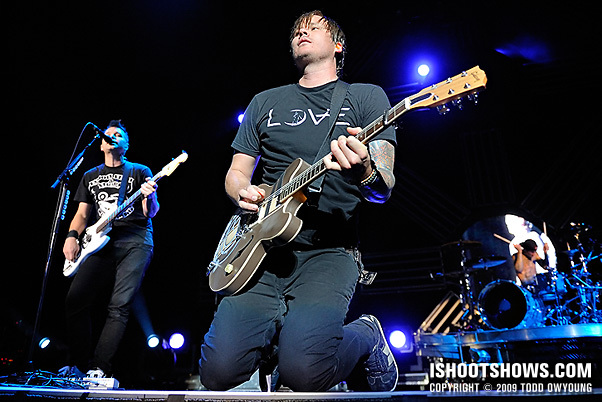 The lighting for this gig was dominated by spotlights on Hoppus, Barker, and DeLonge. While there were video screens and other background effects, at least for this performance, they played a very minor effect during the performance. It's worth noting that this effect is exaggerated by photography; from a more macro view, I think the experience is more balanced. Throughout the three songs, the one constant was spotlights trained on each of the three performers, so exposure shouldn't be an issue aside from the flicker of the spotlights that I always get at this venue. I shot this with the Nikon D3 and Nikon D700. Overall, I'd say this show is a wide-angle and midrange zoom kind of concert. 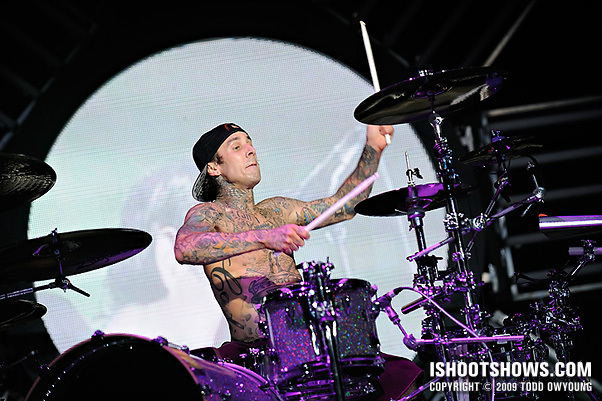 Naturally, Travis Barker at the back of the stage required a the 70-200mm f/2.8, but his band mates were up close enough that they didn't require too much focal length. Still, I shot with the 70-200mm strapped to the D700 and switched off between the 14-24mm and 24-70mm on the D3. Beautiful and sharp images as usual. Gorgeous set. How did the Black Rapid strap work for you? Hey groovehouse, thanks for the comment. The Double Strapped passed the first test. Tonight I have Kings of Leon, Friday night is Billy Talent, and then Sunday is the Farm Aid concert, which is an all-day event. So, I should have plenty of opportunity this week alone to break in the strap. I’ll be giving a full review. these are amazing! theyre flawless. i love these. i got to shoot at the tampa show but only had a pass for all out boy. 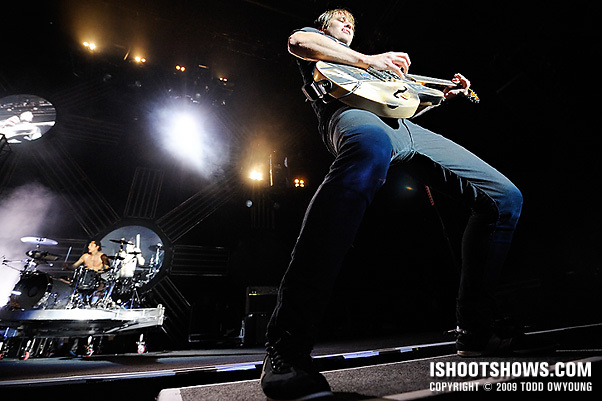 i realllly would have loved to get some shots of blink but i couldnt. but these are incredible! I see all the flaws, but thanks very much for the kind words, glad you enjoyed this set! Are you going to add more at the bottom of the page like you usually have, or is this it? These are just so good. I might go back and see – these are about half of the images that I pulled for the final selection, but they’re what I would deem the best ones. Let me see what I can do about including a fuller gallery, though. Thanks for giving me the heads up over Twitter about the lighting. It was just like you explained, spotlights and not much else. 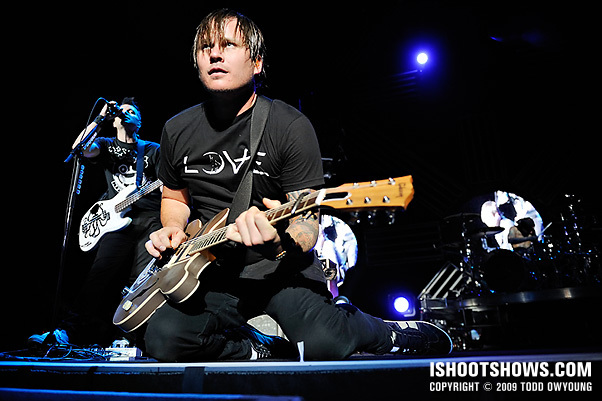 Tom drops down on his knees during the third song, so that’s something to take note of if you’re a photographer reading this and you’re shooting Blink 182 soon. 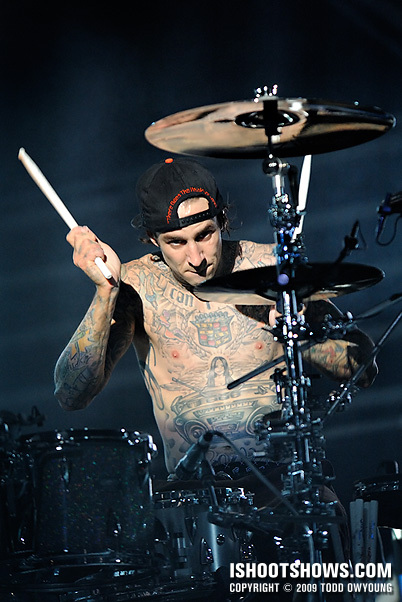 The 70-200mm is perfect for getting great shots of Travis behind the kit, so if you’re limited to using one body, I’d go with a wide lens for the first and third song, and the 70-200mm for the second song to reach Travis hammering away. I’m glad if these notes helped in a small way – thanks for adding your experiences here, I love when people add their own thoughts. 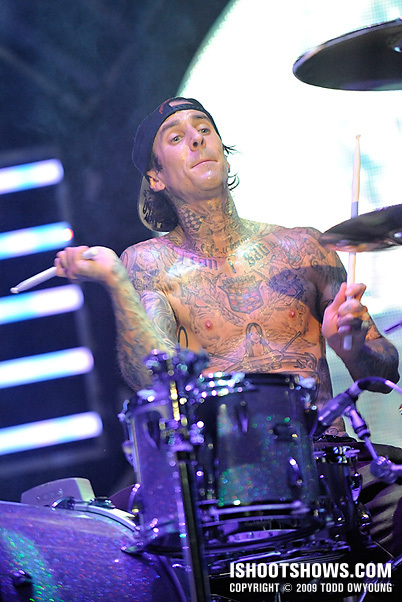 I think that Tom dropped down on his knees for the second song for our set. 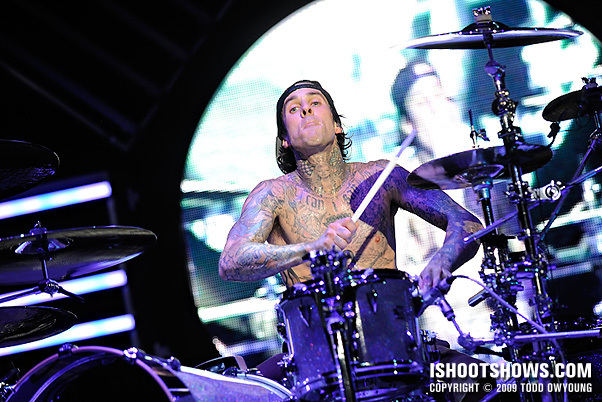 I definitely agree about the 70-200mm being the lens for Travis. I hardly shot anyone else with the telephoto. The first song is definitely a wide-angle lens. 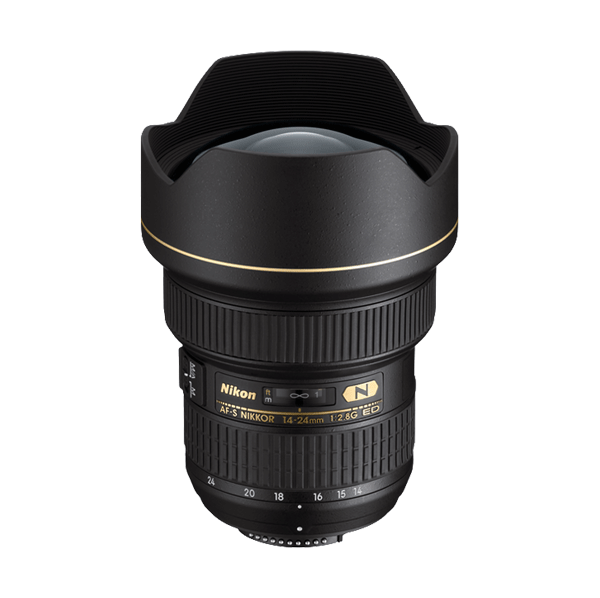 Maybe even ultra-wide, even – 24mm starts to look a little tight next to 14mm. Did you use a second shooter for these or was it just yourself?